Get Strong at Tesuji is volume 6 of the Get Strong at Go series published by Kiseido. The book is compiled by Richard Bozulich from a Nihon Ki-in book Tesuji Kyoka Sho. 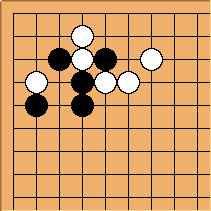 While the book covers a goodly number of different tesuji, particular emphasis is placed on double shortage of liberties, snapback, forcing moves, twirl and two stone edge squeeze. The book contains 534 problems, the right-hand pages (odd page numbers) contain 6 problems. The answers for those 6 problems are on the following page (the left-hand pages, the even page numbers). Each problem is rated for difficulty at one of four levels varying from 25- to 1-kyu up to a few dan level problems. The book is well suited to quick work...drilling pattern recognition skills rather than reading to depth. All problems are framed by a single corner of the board; the problems are local/tactical in nature. The preface to the book recommends spending about 10 seconds on each problem, solve all the problems on a page and move on to the answers. Only one answer, consisting of a single diagram, is provided to each problem. Answers are generally 3 or 5 moves. 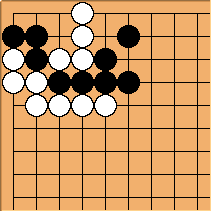 A number of the solutions include the proper necessary response and a preceding valuable forcing move. This is one of the few books in English to have a focus on timing at this skill level. How should Black play in this position? 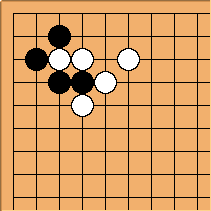 Black to rescue his four stones on the right. How does Black make good shape in the center? 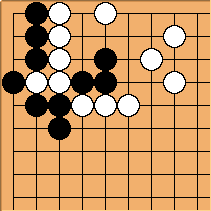 Black to make his stones in the corner invulnerable to attack. 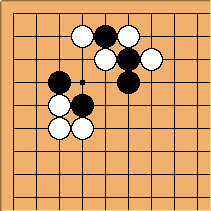 How should Black settle his stones in the corner? 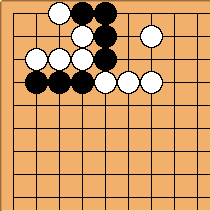 Black to rescue this three stones on the right. It is not enough to be able to solve the problems, you must be able to solve them quickly and consistently. Given 3-5 minutes I generally can solve all the Dan level questions (I'm about 5k) but in actual games I wouldn't even try reading to the same depth. For in real games you must evaluate such problems in case they happen, not after the event.